A friend recently texted to request help with a computer issue. I knew how to do it, so I gladly offered to sit and show them. There was a pause and they asked, “can you just give quick instructions now?” They obviously wanted me to text back a single tweet that would educate them to do a difficult task. Can 140 character count actually do that? Each week, I teach a Sunday School class based on simple teaching. Many believe that it’s a copout. “Simple” must equal “easy”. I can tell you that it’s the opposite. Editing and making a message concise is excruciatingly difficult. If it were easy, everyone would do it. We all want a magic bullet solution. We visit the doctor and request a quick summation for what’s wrong and then hope that a pill, taken once a day for 10 days, will cure our ills. The solution that avoids any “hard work” or long “strategic process” that leads to our goals. Need to lose weight? Companies offer a quick and easy solution when in fact it actually requires time, will-power, and exercise. What took a long time to go wrong usually takes longer to fix. Church communications is difficult. Complex. Complicated. It’s not easy to give a Magic Bullet solution. 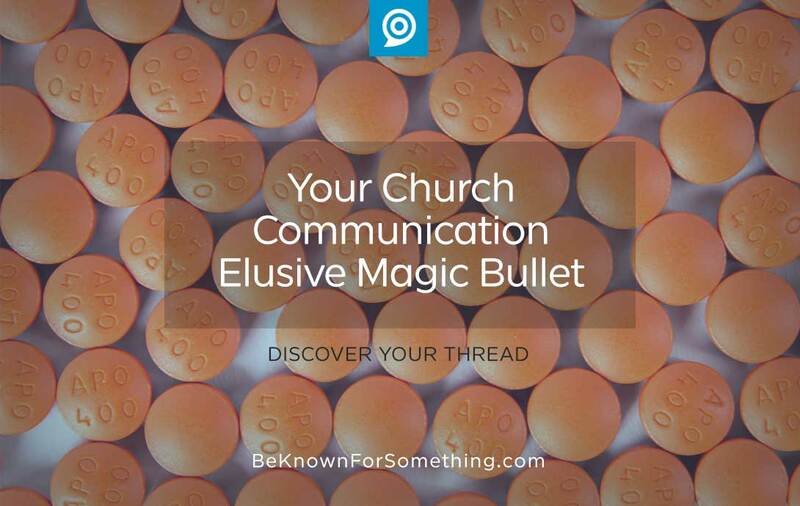 I’ve been in the field for almost 30 years and I’ve written hundreds of articles offering tips and solutions for virtually every church communication problem. People still request “the one thing” that’ll miraculously solve all the issues in their church. Don’t know where to start? Pay for a communications consultant who loves the church and understands it. It’s like hiring a good doctor.